This is perfect weather for warming Risotto. It’s certainly warms the body up from the inside out. I’m sorry that it’s not light on the calories, but every now and then…oh baby, it just hits the spot. This post is for college boy #2. Just ’cause I love you so much. For Risotto you will need Arborio or Carnaroli rice, chicken stock, white wine, Fontina cheese, mascarpone, an onion and a shallot. **Note: my daughter told me that she has used Calrose rice when she didn’t have any Arborio rice. She said that the results were the same. Soooo……if all else fails and you can’t find the Italian short grain you could give the Calrose a shot. First of all you need to get your chicken stock hot. Pour 8 cups into a large pot and bring to a simmer. After the broth comes to a simmer, reduce to low. You want to keep the stock hot at all times during the cooking process. Remove the red wax from the outside of the fontina cheese and discard the red stuff. My onion was pretty large, so I will only need half of it. You want to chop the onion pretty fine. Start by making slices in the onion. Cut the opposite direction to create a small dice. You will need one cup of chopped onions. Set the onions aside. Using the same method as with the onion. Slice the shallot. Then cut in the opposite direction to create a small dice. You will need 2 tablespoons of the chopped shallot. Heat three tablespoons of extra virgin olive oil in a large pot. Cook the onions and shallots until they begin to turn golden. …add the rice to the pan. Stir to coat the rice with oil and continue to cook for about 2 minutes to toast the rice until the edges become translucent. Pour in 1/2 cup white wine. Stir well until the wine has evaporated. Add the chicken broth 1/2 cup at a time to the rice mixture. The hot broth should continue to simmer as you pour it into the rice mixture. Continue the simmer and stir until the broth has evaporated and you can see that the bottom of the pan has no or little liquid. Continue adding the broth 1/2 cup at a time. Continue to keep stirring as the rice simmers. I check the texture of the rice after about 15 minutes of adding broth and stirring. I want the rice to have a bit of a bite to it. You don’t want it to be chalky. The risotto is getting close to being done so I’m going to hurry and grill some asparagus to stir in. I want to add something to my risotto. I have some gorgeous thin asparagus. I broke off the ends and now I’m drizzling a little extra virgin olive oil on the asparagus. Rub the olive oil all over the asparagus. I’m going to grill the asparagus on my cook top using a preheated grill/griddle. The asparagus will grill in about 5 minutes. 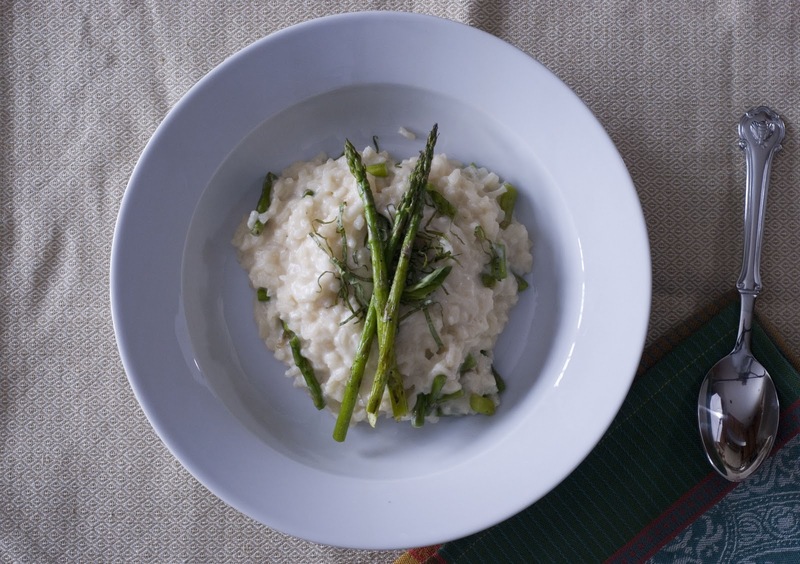 Don’t over cook the asparagus because it will continue to cook once it is stirred into the risotto. Set aside until the risotto has finished cooking. As you can see the risotto is getting creamier. I’ll check the rice once again. If it is still hard, continue to add broth and stir. I like my risotto in the thin creamy side, so I don’t cook out the last addition of broth. I add the last 1/2 – 1 cups of remaining broth. Keep the rice simmering. Now I add the richness. Stir in 8 ounces of mascarpone cheese. The mascarpone will immediately begin to melt into the risotto. I’m sure you have noticed that my risotto is close to the top of the pan. Ugh…I thought that I would use a shallow pan for photo purposes. I should have used a big pot like I normally do. It would have been easier to stir at this point. Oh well it’s working. Remember the fontina cheese we grated earlier? Time to add it! I like to put in about 1 1/2 cups of fontina. Stir until the fontina melts. Because the cheese has a tendency to be a bit salty, I wait to salt the risotto. I don’t want to add too much salt at the beginning for this reason. I think the risotto needs about 1/2 teaspoon of salt. Stir in the grilled asparagus. I love the flavor the grilled asparagus gives the risotto. I had some fresh basil and decided to do a very thin slice to sprinkle over the top of my risotto. I loved the flavor and brightness that it brought to the rice. I think my body is beginning to thaw, now. Ahhh, a hot steaming bowl of risotto. In a pot heat chicken stock. Keep the stock on low heat while making risotto. In a heavy, wide, 3- to 4-quart casserole or pot, heat the olive oil over medium heat. Cook the onions and shallots together until lightly golden, stirring often, about 8 minutes. Add the rice and stir to coat with oil. Toast the rice until the edges become translucent, 1 to 2 minutes. Pour in the wine and stir well until evaporated. Add 1/2 cup of the hot stock. Cook, stirring constantly, until all the stock has been absorbed. Continue to add hot stock in small batches – just enough to completely moisten the rice – and cook until each successive batch has been absorbed. Stir constantly and adjust the level of heat so the rice is simmering very gently until the rice is creamy but al dente. This will take 20-25 minutes from the time the wine was added. Vegetables: Asparagus, zucchini, broccoli, fresh peas, etc. Stir-fry vegetables a few minutes and season them with salt and pepper before adding. Meats: Grilled chicken breast sliced, fish or shell fish. Cook fish before adding to risotto. Fold in last. – Always serve risotto immediately after cooking. – When in doubt under cook; risotto continues to cook before it is served. – Risotto can be tight and dense or soft and runny depending on personal taste. It is a matter of adding more stock at the end of the cooking process not cooking that last addition of stock until the rice as absorbed it. – The stock or cooking liquid must be kept hot over low heat so that the addition does not interrupt the cooking process. It should be added about 1/2 cup at a time. Use your imagination with the risotto you make. You can add Parmesan in place of fontina. I’m rather fond of broccoli stirred in as well. The husband that never reads this blog is a meat lover, so I grill chicken breast, slice it and arrange it over the top of a hot bowl of risotto topped with Parmesan and a chiffonade of basil. He’s so lucky to have me! The Ottosen Family are my new best friends! So, I've now made; Baked oatmeal, Beef Fontina Sandwich, and this… YUMMMMM! I just keep picking new recipes and they are a huge hit with me and my family. Next Carbonara! I think I'll make that for dinner tomorrow night! LOVE, LOVE, LOVE the recipes! I wish I had a French onion soup recipe that I loved. I'll check into a see what I can find. Good luck with the Risotto. Hahaha. You crack me up, Whitney. Seriously, it's 11 PM, and if I had the mascarpone, I'd make it right this instant.